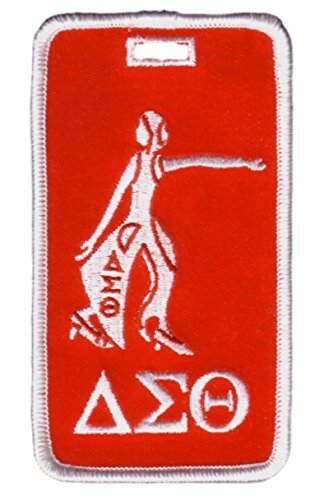 Delta Sigma Theta Lady Dive Embroidered Luggage Tag by Delta Sigma Theta at Our Lady of Sorrows Church. Hurry! Limited time offer. Offer valid only while supplies last. New Greek luggage tags are heavy duty with full embroidery on a twill background. They measure 4 1/2'' x 2 1/2''. Each tag has a strong vinyl I.D. New Greek luggage tags are heavy duty with full embroidery on a twill background. They measure 4 1/2" x 2 1/2". Each tag has a strong vinyl I.D. window pocket on the back for your business card or school id. A luggage tag strap cord is provided. A great gift for alumni or back to school to be used on luggage, lap top cases, trunks, athletic bags,and backpacks. Black Greek Paraphernalia!! If you have any questions about this product by Delta Sigma Theta, contact us by completing and submitting the form below. If you are looking for a specif part number, please include it with your message.